Although the participants fill out this survey after the market closes on Wednesdays, the AAII this week actually showed an increase in bearish sentiment. Considering that we had an amazingly trending upday with a wide range, you have to wonder just what it will take to sooth the ruffled feathers of retail investors. AAII bears went from 53% to 56% while bulls came in at only 29%. This sentiment measure is now showing real fear unlike a few months ago. Back then I theorized that the retail investors weren’t scared because they simply didn’t have anything invested. Now it seems that they are again committed to the market and very worried. Which, in contrarianland is a great sign that we are going to have a continuing rally here. According to AMG Data Services, the only week in November with positive fund flow was the second to last with a tiny uptick. The other weeks saw massive mutual fund redemptions. In fact, the second week of November witnessed a spike of mutual fund sales which was significantly higher than mid-August this year. As scood commented, there is a huge pile of money sitting in money market funds. So it seems that the crowd has been fleeing the domestic equity market and taking refuge in fixed income. Time to zig when the crowd zags. But what I don’t understand is if the crowd is sitting in money market funds again, why are they scared now about the stock market’s recent turbulence? 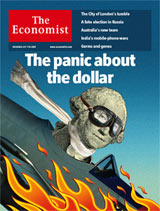 The Economist cover for this week is a bit of a conundrum. The dollar has been crashing and burning for some time now. That’s not news. At first glance it seems to be a classic contrarian bullish cover… but the fact that they’ve used the word “panic” in the heading gives me pause. It is a bit too self-aware for my taste. What emotions do you think it conveys? DOLLAR HAS BOTTOMED. The cover article on the magazine means that this is a perfect contrarian indicator. I would be fine if the dollar crashed. It wouldn’t be all that bad really. Maybe they’re [ind. investors] more worried now because they read about cash funds imploded, frozen or buck busted every day. Flight to safety indeed– guess the can under the rock inthe yard is next, you’ve got to keep it somewhere. Did tech stocks do well in the 70s? After the meltdown in 74 that is. Seems to me they did. Might relate to now, at least if we’re about to have inflation and not deflation. Certainly has to be the preference of central bankers and politicos everywhere.